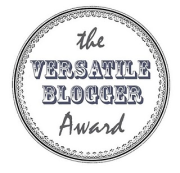 I have recently been nominated by Sarah at Toby Goes Bananas for a Versatile Blogger Award, thanks so much Sarah. It’s an award given by other bloggers who enjoy reading your blog, and who feel you write an interesting and diverse range of posts. So I am very happy to be nominated. 1. I grew up in Scotland (age 3-10) and used to have a thick and fast Scottish accent. We moved back to England when my Dad died and I now can’t even attempt a Scottish accent now. 2. I rescued all my dogs from the vets where I used to work. I couldn’t resist them. It is shocking how people treat their animals and I was so grateful to find my little dogs. My dogs are mother and daughter. 3. I have ridden most of my life, since I was three and until a few years ago. I have a passion for Dressage, but have also jumped in the past. I have damaged myself countless times from various falls, some more spectacular than others. I now suffer so much with back pain that I have retired. 4. I knew Mr Hubby’s sister before I knew him. I met him on her leaving do (as we used to work together). He travelled from Berkshire to Chester for her party and we started seeing each other immediately. That was 14 1/2 years ago. 5. Mr Hubby and I got married in 2006 and our wedding cost approx £3k – I love a bargain. 7. In 2011 I raised over £500 running in the Race For Life. I am not a runner, but as my mum is a breast cancer survivor it was very important for me to take part. As I have 3 prolapsed discs and arthritis, I couldn’t walk for a week afterwards! I can’t wait to read their posts.